Let’s say you’ve discovered a new method to cope with a problematic emotion or behavior, such as anxiety, depression, irritability, impulsivity, or procrastination, to name a few. Perhaps you’ve learned about a new technique such as meditation, from a therapist, friend, podcast, or blog, and you want to see if meditating would be good for you. Now what? As a therapist, I’ve seen many clients who struggle to implement new coping skills once they’ve learned them. Practice. I’ve taught clients many different coping skills, and at times I’ve found that they do not practice these skills outside of therapy sessions. If you learn a new technique, you should continue to practice it on your own. Don’t wait for a therapist, friend, podcast, or blog to re-introduce the skill to you or encourage you to use it. Practice it consistently on your own. Practice when you’re feeling OK. The most common mistake my clients make when they learn a new skill is that they practice it only when they need to use it, such as when they’re experiencing a problematic emotion or behavior. It’s important to also practice when you are not in the middle of that emotion or behavior. This will allow you to become comfortable using the skill and might even help you to develop muscle memory. For example, you can practice meditation when you’re feeling calm and focused. This may help you to meditate more easily when you experience the problematic emotion or behavior that you want to manage. Make it your own. Coping skills are not one size fits all. Everyone is different, and that means people need not only different coping techniques but also different variations on the same techniques. For example, some people benefit from meditation that is focused only on the present moment without external direction, while others benefit more from a guided meditation in which they follow directions from a narrator or another external source. In this sense, there is no right or wrong way to meditate as long as it’s beneficial to you. When you learn a new skill, it’s OK to tweak it in order to meet your needs. Have realistic expectations. Coping skills are not magic bullets. They don’t work 100% of the time in every situation. When you learn a new skill, make sure that your expectations of its effectiveness are realistic. Successful coping skills work some of the time, not all the time. If you meditate and it helps you manage a problematic emotion or behavior 40% of the time, that’s a successful coping skill. It’s a good idea to know multiple skills that you can use in case one is not effective on a given day. You can also combine skills in order to increase their effectiveness. For example, you could combine meditation with deep breathing and positive affirmations. Ask questions. When you learn something new, it often feels uncomfortable or strange. You might not know whether you’re doing it right or how it’s supposed to work. Ask as many questions as you need in order to gain a complete understanding of your new skill. Some questions might come up after you’ve already learned the technique and begun practicing it. That’s fine. Go back to the source or person who taught you the skill and ask them about it. Next time you learn a new coping skill, try these tips to help you practice your technique. 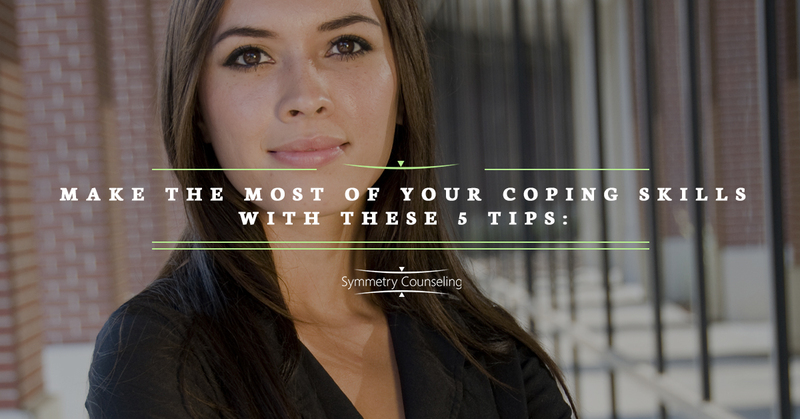 Do you need help learning or practicing coping skills? If so, you might benefit from working with a counselor. Contact Symmetry Counseling at 312-578-9990 to schedule an appointment.